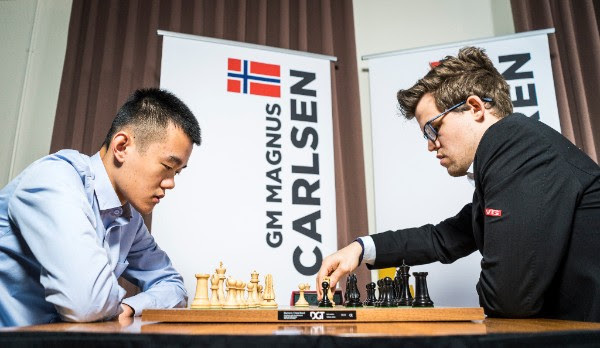 It was the final day for three of the matches, while Ding Liren and Magnus Carlsen battled it out in the g/20 day. 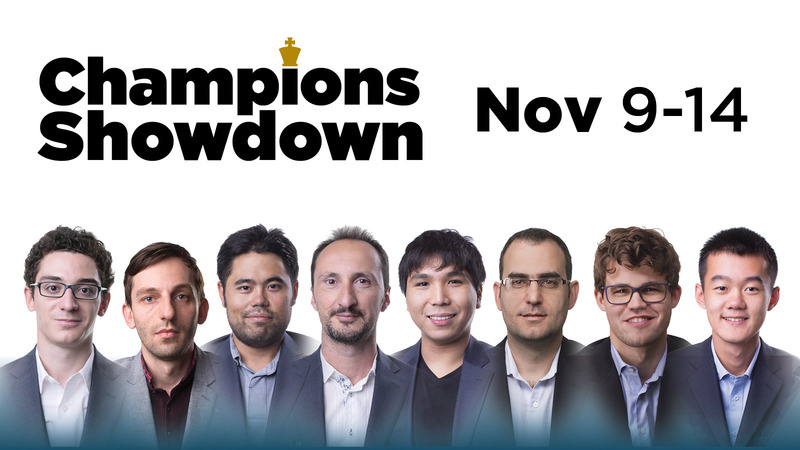 Two of the finishing bouts went basically down to the wire, while Nakamura against Topalov was a very one-sided affair. The action of the blitz was very tense, and blood was, literally, spilled over the board! 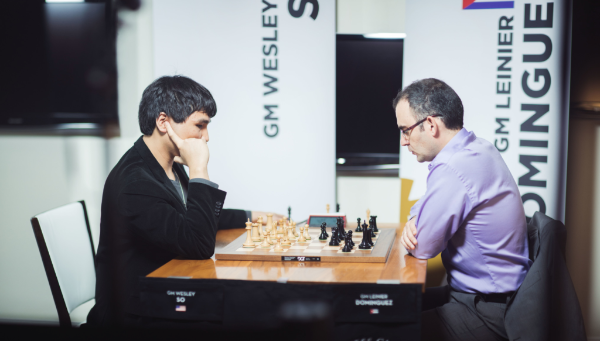 Caruana entered the last day with a two game deficit, but had momentum going for him. He scored heavily toward the end of day three, and he came in with fire on the board. Caruana won his two first whites, tying the match very early. Grischuk was not about to be left behind, and retaliated immediately. 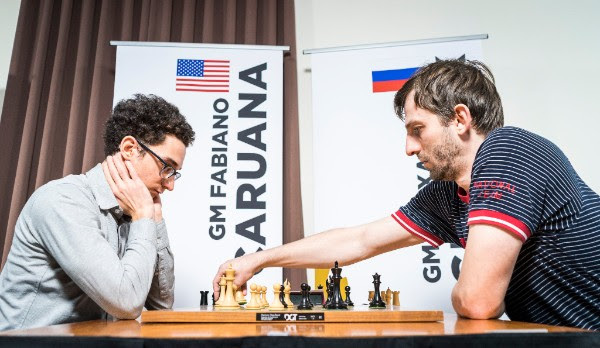 The tension built up increasingly with every game, but it was Caruana that kept the better nerves and kept delivering blows. He was unstoppable with the black pieces and won three in a row with that color. Grischuk found himself needing to win the last two rounds to equalize the match, but was unable to do so. A fabulous day for Fabi, as he wins the 5-minute portion by a huge score of 8.5-3.5 (with points counting for two, that gave him 17 points against his opponent's 7) which was enough to catapult him to the win. It seemed like Caruana's comeback story would be the focus of attention today, but So had something to say about that. Trailing by 16 points with three games to go yesterday, So was simply a complete monster in the second half of the g/10 and all throughout today. Obtaining huge advantages on the clock and combining it with powerful and precise play, So turned the match around and even won the head-to-head with a full round to spare. Dominguez proved superiority in the rapid, but it was all So in the blitz. 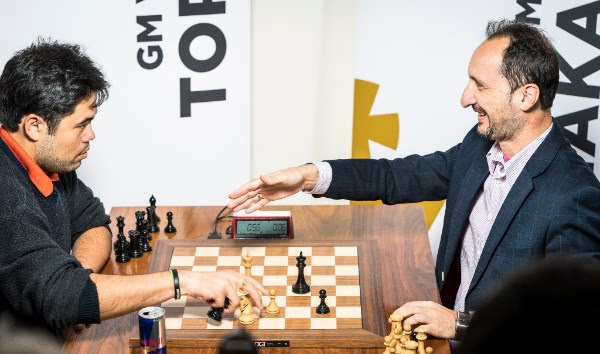 On an interesting note So was so focused on banging the clock and putting that pressure on his opponent, that Carlsen requested that this match be played as far away from his board as possible, since it was distracting! So at some pointed even started bleeding from hitting the clock so hard, which forced the arbiters to pause the game and wipe the clock. One can very strongly argue that the result of the match did not reflect how close the games were, as we saw combative and active chess. 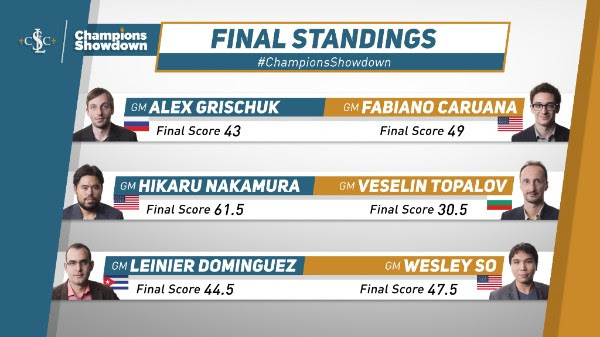 That being said, Nakamura finished the day with double the amount of points of Topalov, clinched the match after only three of today's twelve rounds, and proved very clearly who was the better player. Nakamura's resourcefulness and speed in the fast time controls simply smashed his opponent all day. The lion roars! Carlsen was absolutely relentless, playing fast, confident, and precise chess. Ding Liren was unable to keep pace and lost several positions that perhaps shouldn't have been. 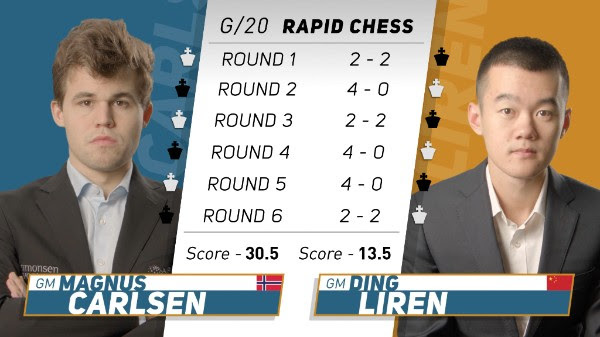 In the second round, a relatively equal endgame finished in favor of Carlsen, and it seemed to be what opened the floodgates. The World Champion simply annihilated his opponent in the fourth and fifth games, and takes a huge advantage going into their third day of play.